The state of Oaxaca is Mexico’s fifth largest state, with an area of 93,793 square kilometers (4.8% of the national total) and Mexico’s tenth most populous state, with 3.8 million inhabitants in 2010. The state has considerable variety in terms of relief, climate and natural vegetation, and has about 570 km of shoreline bordering the Pacific Ocean. Oaxaca City, the centrally located state capital, is an important city for tourism as are three towns on the coast—Puerto Angel, Puerto Escondido and Huatulco. 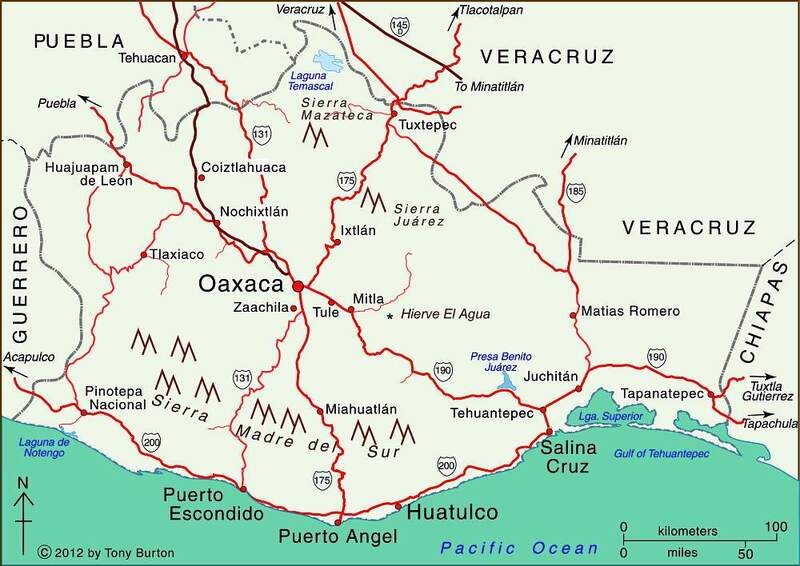 The eastern part of Oaxaca state is part of the low-lying Isthmus of Tehuantepec, once considered as an alternative location to Panama for a trans-continental canal. In recent years, the Tehuantepec area has received massive investments in wind power, with several major wind farms already operational and more on the drawing board. Oaxaca state state has greater linguistic and cultural diversity than any other state in Mexico. According to the National Commission for the Development of Indigenous Peoples, more than 1.5 million people in Oaxaca live in a home where at least one of the residents either speaks an indigenous language or considers themselves indigenous (even if they do not speak an indigenous language). About one million inhabitants of Oaxaca, 35% of the state’s total population, speak one or more indigenous language. The largest indigenous linguistic groups in the state include about 350,000 Zapotec, 230,000 Mixtec, 165,000 Mazatec, 100,000 Chinantec, 100,000 Mixe, and 40,000 Chatino. Where do most foreigners live in Mexico? Why is biomass density in Mexico relevant to climate change?